Flowers are an essential element in every wedding. They bring colour, aroma and create a graceful and intimate ambiance. From table centerpieces to bouquets and even petals along the aisle of the wedding ceremony, flowers play an important role in setting the mood for your big day. In this post, we're featuring some of our favourite wedding florals and the meanings and symbolisms behind these blushing blooms. White Hydrangeas featuring the classic Bamboo Forest Jade Bangle. A lace of dainty star-shaped petals clustered into a sphere, the hydrangea is a symbol for heartfelt emotions and gratitude for understanding. Hydrangeas are amazingly compatible with weddings as they are ideal as bouquets, arrangements and even as wedding cake toppers. It also celebrates heartfelt praise and appreciation which makes it is the perfect flower to show gratitude towards the special people who played a part in making the wedding a successful event. In particular, the white hydrangea symbolises purity, grace and abundance - fitting qualities for such a remarkable day. For centuries, roses have been the most iconic of flowers to represent true love. Revered and celebrated for its beauty and significance, there is no flower more favoured than the rose. Also known as the bridal rose, the white rose is a traditional wedding flower, known for its association with purity, loyalty and virtue. 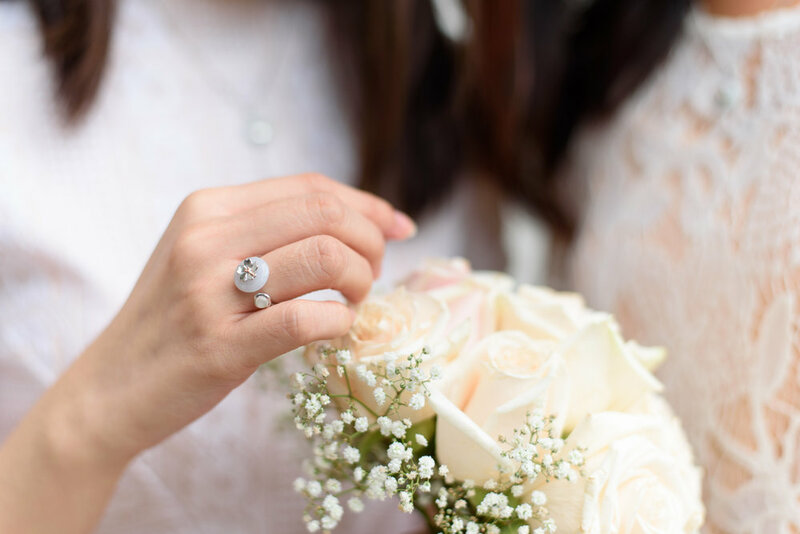 A representation of new beginnings and everlasting love, the white rose is the perfect floral to commemorate the start of a new life with your partner. The white rose looks exceptionally stunning when paired with baby breath flowers and the embodiment of both qualities make an unparalleled and exceptional bouquet. With its growing popularity in recent years, the baby breath flower is no longer just a filler for bouquets but can also be a bouquet on its own. The baby breath flower is gorgeous as venue decorations, wreaths for your bridesmaids and even as a boutonniere for the groom. These delicate flowers that resemble tiny clouds personify innocence, everlasting love and purity. The tiny flowers are a representation of the pure emotions the couple should have for each other. Signifying self-discipline and the ability to stay focused on love, these are qualities that are especially important for a marriage where trials are inevitable. We believe that every girl deserves the irresistible and alluring wedding that she dreams of and flowers are salient in beautifying this momentous day. We hope that through this brief guide on our favourite wedding florals, you will have an easier and more gratifying time in selecting the perfect blooms for your wedding.